When I started to think about being helpless offshore, to far to swim... Which options are left normally? Getting noticed or picked up by another is the answer. However I want to be able to help myself out if I can, I don't want to bother someone else because a rope broke. 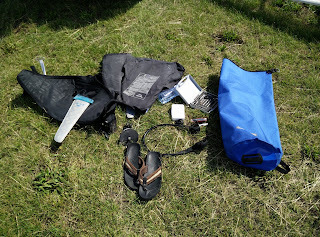 Some parts cannot be taken easy (like a spare mast, boom or board), however a second mastfoot, fin, ropes and more small stuff could be taken therefor I searched for a waterproof and simple bag. I ended up with the Ortlieb X-plorer, I liked the simplicity and it seemed to be well built. 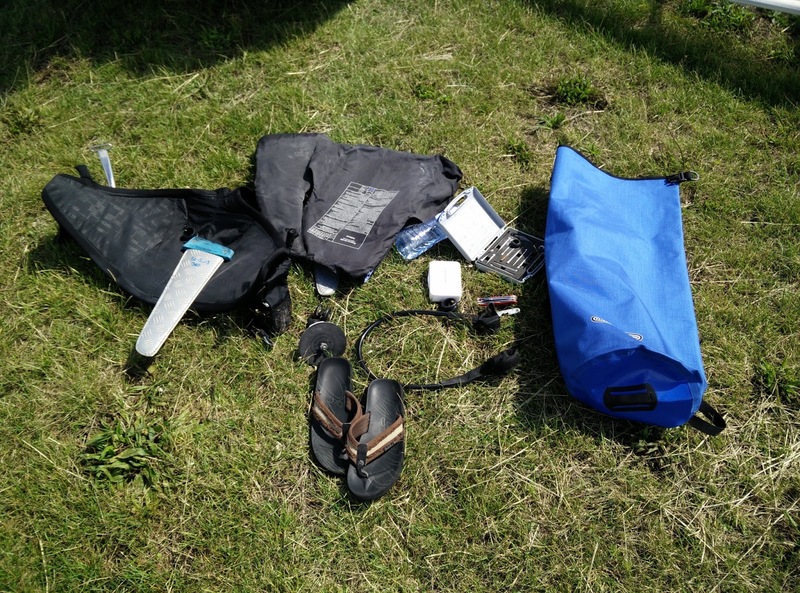 Last session I tried to surf with small stuff in my Ortlieb X-plorer see the picture below. Contrary to the manual I push as much air out of the bag as possible, this has to do with swimming and floating. If it would be full of air the bag will be difficult to swim with.